No matter what shape, size, or color, each one comes complete with a huge personality. The Siberian Husky is a medium-sized working dog. Males range from 21 to 23½ inches tall at the shoulder blades and weigh 45-60 pounds. Females are 20 to 22 inches tall at the shoulder blades weigh 35 to 50 pounds. They have a double coat that sheds twice a year. 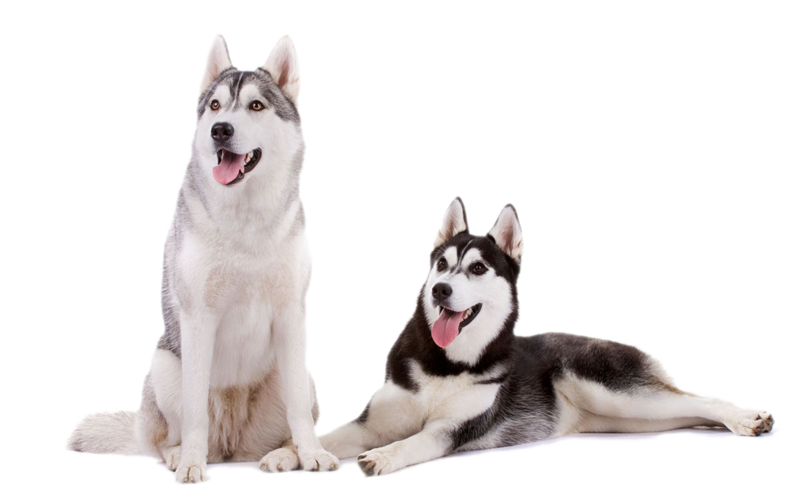 Huskies come with a variety of markings and striking patterns not found in other breeds. Siberian Huskies are hard to resist, with their joyful demeanor, exuberance, friendliness, striking appearance, and incredibly beautiful smile. However, as appealing as these traits may be, Huskies are not the breed for every dog owner. After learning more about the Husky, many have decided to only admire from afar, while others can't get enough of them. While they may look beautiful with those striking blue eyes, how well do you know the breed? Are you up for the challenge? Here's a quick glance of huskies in action. There are many activities you can do with your husky. While they are known for sled races, there are similar activities you can perform with your dog, even in warmer climates. These activities include Cani-cross, bike-joring, scootering, ski-joring, dry-land sledding and of course the traditional sledding through snow. You can also take your husky for a walk, take them to a dog park to play with their companions, or even set up a play date with their husky friends (and yours) at your house.